Soaring Student Debt in the U.S. May Soon Reach $1 Trillion! 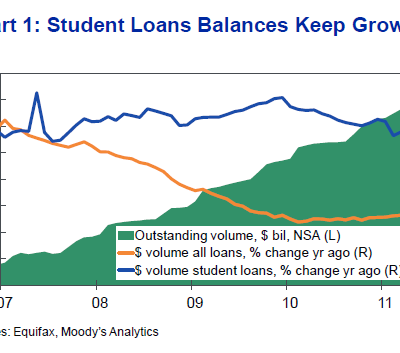 Student loan debt now surpasses total credit card debt in the United States. While you hear horror stories about credit card debt all the time there is very little discussion on the epidemic of student loan debt. The chart here doesn’t account for the recent trend and it is very likely that we are quickly approaching $1 trillion in total outstanding student loan debt. Keep in mind that the above chart doesn’t cover the total cost of education as you also have many students financing books and other expenses on their credit cards compounding the debt burden. 64% of consumers own a home, versus 65% this time a year ago. Gen Y has added more bills than any other age segment [22%] and are planning to spend more than any other segment across categories: 28% on clothing, 21% on vacations, 34% on groceries and 17% on personal care.